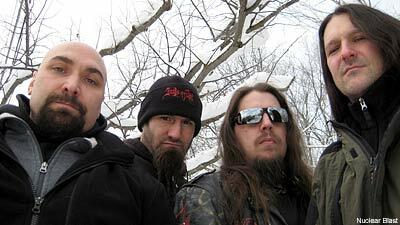 Immolation will be metalling and pillaging their way through the U.S. this fall on their first headline run in support of their Nuclear Blast debut, 'Majesty and Decay.' They will be supported by Vader, Abigail Williams, Lecherous Nocturne and Pathology, making for an intimate evening that's as subtle as a Panzer tank bulldozing through your kitchen. The band will debut material from 'Majesty' and will delve deep into their catalog, playing songs off their seven previous platters. Choosing the songs for the performance has become a bit of a chore for the band. "Deciding on a set list has become the most difficult part of being in the band these days for many reasons," vocalist Ross Dolan told Noisecreep. "We have more and more to choose from, song-wise, so as our catalog gets bigger, so do the choices. Time always becomes a factor, and when we are touring as support for someone else, we are aware that we are going to have a shorter amount of time to play each night, so this plays into our decision making. "We usually try picking songs that are strong and yet songs that we haven't played on the last four or five tours, and more importantly, we try to represent every album and play at least one or two tracks off each release. There are always preferences, and we all have different preferences when it comes to picking the songs, but we can usually work this out way before we even begin rehearsing for the tour." "In the end, we are well aware we will never make everyone happy, and we are always going to leave out someone's favorite song, but just know we do try, and if we skipped something you like, there's a good chance we will play it the next time around." One thing is a definite at an Immolation show and that's decibels. Dolan doesn't advocate or discourage the usage of earplugs at their shows. "I personally never like to wear earplugs when I go to a concert, but that's just me," he said. "There are times when there are venues that have a really powerful sound system, and if things aren't mixed correctly, it can sometimes be harsh on the ears, so I completely understand resorting to earplugs. I guess to each his own, but it's all about enjoying the show and having a good time, earplugs or not!"